One of the features of Firefox 2 is Session Restore. By default, if Firefox needs to restart for an update (or crashes), it will restore your session to the state it was in at the time of restart. That means your tabs and windows will be just like you left them. Even if it only worked after crashes and required restarts, this would be a great feature. Firefox is notorious for its insatiable memory usage. As an example, after several days of heavy usage, Firefox was using 652 MB of memory on my Windows XP desktop. After restarting, Firefox was down to a svelte 33 MB. Unfortunately, before the Session Restore feature, restarting Firefox to free up memory meant re-opening all the tabs and windows you had before. 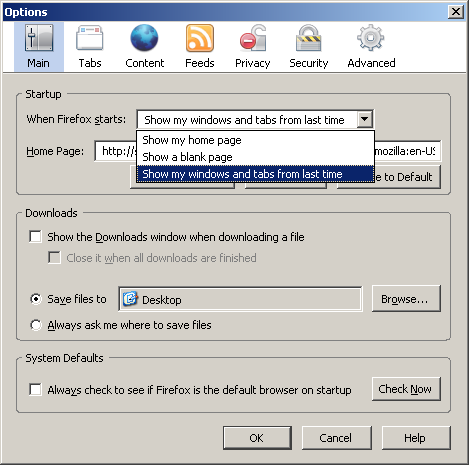 But now, you can have Firefox restore your previous session by selecting 'Show my windows and tabs from last time' in the Startup area of the Main options window. This looks slightly different in Mac OS X, but is essentially the same. Once that's done, give it a try. Restart Firefox and watch all your tabs and windows open up again. In terms of productivity, this is a huge advance. Before this feature, I would dread restarting Firefox, knowing that I would have to open up at least five tabs just to get back to where I was. Now, when I feel Firefox is being sluggish, I can restart and back to work. I find out a thing new on a number of sites every day. It will always be stimulative to discover written content of other writers and learn a little a thing from them. Thank you sharing.